This is the first career Manhattan Beach Open title for Nick Lucena and the fifth for 2008 Olympic Gold Medalist Phil Dalhausser. 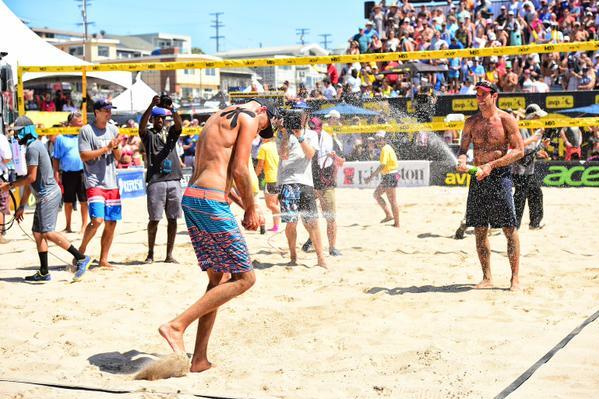 What a weekend on the sand for PMG Sports clients Phil Dalhausser and Nick Lucena! Phil and Nick charged into the finals of the AVP Manhattan Beach Open without dropping a set and knocked off Tri Bourne and John Hyden in the final match, 21-19, 21-17. This was Nick Lucena’s first career Manhattan Beach Open title and the fifth for 2008 Olympic Gold Medalist Phil Dalhausser. He is now just 2 titles shy of the Manhattan Beach Open record of 7 set by beach volleyball legend Karch Kiraly. Phil was a beast at the net, blocking shots and altering the strategy of the world’s top players all weekend. Nick put together a great tournament and provided some much needed backbone on defense after the duo went down early in the first and second sets of the final match. This wasn’t their first trip to Manhattan Beach as partners however. Back in 2005, these two good friends were just getting started on the AVP Tour and took home a runner-up finish at the Open that year. This time they brought home the hardware! With the 2016 Olympic Games in Rio just under a year out and counting, Phil and Nick are building some serious momentum on the beach for the United States. They fought their way to a solid runner-up finish at the AVP Kingston Seattle Open in their first event together last week before the big win at Manhattan Beach. There are 3 events remaining on the AVP Tour this year as well as a full schedule of FIVB and Olympic qualifying events. Beach volleyball is sure to be one of the hottest tickets in Rio next year given the host country’s love affair with the sport. Phil and Nick are currently fielding opportunities for new sponsors and corporate partners as they look to build on their early success as playing partners moving forward. For sponsorship opportunities please contact Steven Weinreb at steven@pmgsports.com or call (917)338-1665. For media inquiries please contact Matt Uberseder at matt@pmgsports.com or call (919)459-5428.